I would personally prefer to see a running hospital as the background with TH music playing instead of having a silent main menu with a background image. I would like to see the view jump around the hospital and I would like to see new versions show different hospitals as their main menu background. Click on this screenshot if you want to enlarge it. I had this idea months ago but one reason why I've not suggested it until now is because I thought I would feel a bit selfish suggesting this idea when someone has spent some of their free time making the main menu background image. 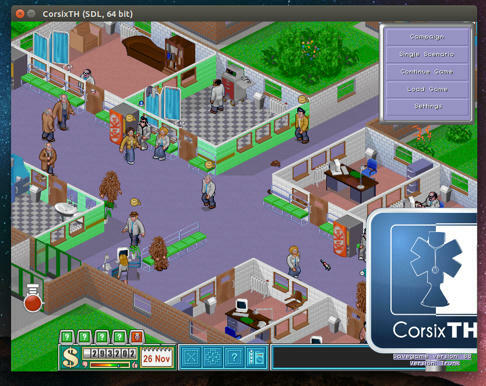 But this image could still be used in other places and it could appear as the main menu background for 2 seconds when the game has started before disappearing to reveal the running hospital background. I will create an image tommorow showing a new main menu button layout which could be used with the running hospital background to prevent the center of the hospital view from being covered by a button panel. I like the idea, but the main menu would look a lot sleeker without any of the in game UI present. So you could just see a cropped scene of perhaps patients being cured, doctors running around etc. Apart from that, a very good idea!